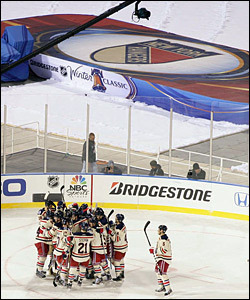 The National Hockey League announced on Wednesday that the Rangers will play both the New Jersey Devils and New York Islanders next January at Yankee Stadium as part of the 2014 Coors Light NHL Stadium Series. The Rangers will face the Devils on Jan. 26, 2014, at 12:30 p.m., and go up against the Islanders on Jan. 29, 2014, at 7:30 p.m.
Rangers fans will be in for a treat next January with the unique opportunity to watch a pair of games at Yankee Stadium -- the first outdoor NHL games ever to be played in the New York metropolitan area. Both games will be considered road games for the Rangers, as the Devils will be the home team on Jan. 26 and the Islanders will be the home team on Jan. 29. The two games at Yankee Stadium complete the four-game 2014 Coors Light NHL Stadium Series scheduled for next season. On Jan. 25, the Anaheim Ducks will play the Los Angeles Kings at Dodger Stadium. On March 1, the Chicago Blackhawks will host the Pittsburgh Penguins at Soldier Field. In just five years of its existence, Yankee Stadium already has provided the setting for some of the country’s most popular events as the baseball diamond has been transformed to host games between several of college football’s finest programs –- including the annual New Era Pinstripe Bowl – concerts by Grammy Award-winning acts, top-tier soccer talent from around the world and a super welterweight title boxing match. However, the 2014 Coors Light NHL Stadium Series™ will be the first time the Stadium has been used for hockey. As one of the world’s most prestigious addresses, the original Yankee Stadium was also the home for scores of additional sports, entertainment and cultural events, as well as political assemblies, three Papal masses, religious conventions, concerts, NYU commencements and the circus. The rivalries among the three NHL clubs based in the New York metropolitan area go well beyond the natural contentiousness of proximity. The Rangers, Islanders and Devils each have been successful on the ice, combining to win 11 Stanley Cup Championships, including eight of the past 32. Division foes during the regular season, the teams also have battled each other during memorable postseasons. The Rangers and Devils have met six times in the Playoffs. Perhaps the most memorable of those series was in 1994 when the clubs faced off in the Eastern Conference Final. After proving to be the two best teams in the League during the regular season, they required a legendary series to determine the Eastern Conference champion, with the Rangers’ Stephane Matteau winning the deciding Game 7 in double-overtime. The Rangers went on to win the Stanley Cup® in seven games over the Vancouver Canucks. The Devils countered 12 months later by winning the first of their three Stanley Cup® Championships over the following nine seasons. The Rangers and Islanders have met eight times in the postseason, including four straight years from 1981-84. The Devils and Islanders have met once in the post-season, with New Jersey earning a 4-2 series victory in the 1988 Patrick Division Semifinal. The Rangers first played the Islanders in a regular-season game on Oct. 21, 1972, at Nassau Coliseum – a 2-1 win by the Rangers. The Rangers first faced the Devils in a regular-season game (after the team moved to New Jersey) on Oct. 8, 1982, at Brendan Byrne Arena – a 3-2 victory by the Devils. Further details on this special NHL event, including national broadcast information and specifics on ticket opportunities for the season-ticket holders of each team, will be released shortly.